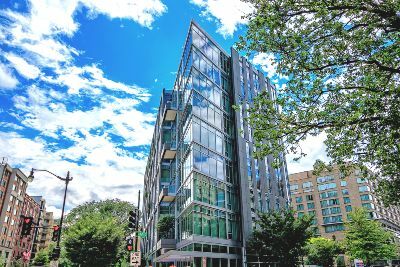 The West End might be one of Washington, DC’s oldest communities but it continues to evolve, including new upscale condominium developments like 22 West. The award-winning nine-story building was delivered in 2008 and features 92 residences in a variety of floor plans. 22 West is located at 1177 22nd Street NW, at the corner of 22nd and M Street. From the street, 22 West presents a modern appeal with linear steel and glass design. Inside, you’ll find one-bedroom with den, two-bedroom and three-bedroom residences. Layouts include flat, loft and townhouse styles with incredible soaring ceilings. The largest units feature full-sized libraries and up to four baths. On top of all that, penthouse models have private rooftop decks. Sizes range from a roomy 948 all the way up to 3,629 square feet. These bright and open city homes are flooded with natural light from huge floor-to-ceiling windows. There are beautiful oak hardwood floors throughout, with the living space melding seamlessly into gourmet kitchens that are set into the walls. In fact, if you don’t look closely you might not even realize the kitchens are there! But they are, with white marble counters and Bosch and SubZero appliances disguised by white Poggenpohl cabinets. The West End neighborhood is bordered by Dupont Circle to the northeast, Foggy Bottom to the south and Georgetown to the west. West 22 is within strolling distance to the White House and surrounded by a wealth of conveniences and attractions, including a Trader Joe’s and top restaurants like Marcel’s by Robert Wiedmaier, Ris Bistro, Bayou, Char Bar, Bourbon Coffee and many more. As for mass transit, residents are served by the Foggy Bottom and Dupont Circle Metro stations. 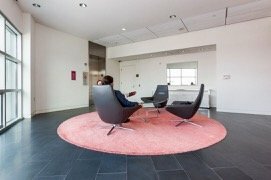 Shared amenities at 22 West include a modern lobby with staffed front desk, concierge and doorman, along with underground parking, bicycle storage, a fitness room, lounge and large outdoor terrace with lovely greenery. It’s all topped off by a rooftop swimming pool, sun deck and lounge area, not to mention spectacular views. True to its name, the 22 West condominium is located in the West End neighborhood. That said, it is also part of Downtown DC with its grouping of centrally located urban communities. The actual street address is 1177 22nd Street, Washington, DC. Completed in 2008, this nine-story modern and stylish building is home to 92 residences and a stunning 71 unique floorplans. Luxury condos for sale come in one, two and three-bedroom models. Some also include an additional den, and supersized penthouse units have up to four bathrooms. 22 West is at the corner of 22nd Street and M Street, across the street from the Ritz Carlton Hotel and Residences, a mixed-use community that integrates Equinox Sports Club, restaurants and more. 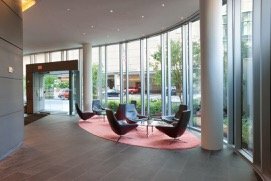 22 West is also steps from a myriad of other amenities and attractions, and walking distance from both the Foggy Bottom/GWU and Dupont Circle Metro Stations. Among the cluster of neighborhoods associated with the West End and Downtown, are Georgetown, Foggy Bottom, Dupont Circle, Chinatown, Judiciary Square and the Mount Vernon Triangle. Condos for sale at 22 West range in size from 948 to 3,629 square feet, the largest being select 9th floor penthouses with their own private rooftop decks. In 2009, the building received the RADA Grand Award for Best Multifamily Design in the United States. Massive window walls allow natural light to flood over oak hardwood floors, while open space designs flow organically into gourmet kitchens with stainless steel Bosch and SubZero appliances. 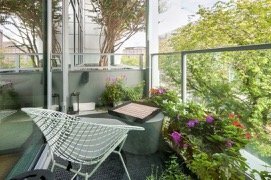 Residents also enjoy private outdoor spaces and exquisite bathrooms with slate floors and deep soaking cast iron tubs. 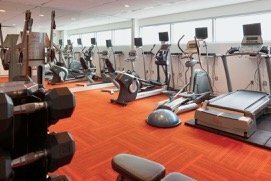 There’s plenty of common amenities as well, including a 24/7 front desk with concierge and doorman, underground parking, a state-of-the-art fitness room, a lounge, and rooftop pull with sundeck and garden. Plus, stroll to Soi 38, Bourbon Coffee, Grillfish, Blue Duck Tavern, Whole Foods and more! To learn more about condos for sale at 22 West, call District Partners Real Estate, LLC, at 202-798-3600.